Almost everybody loves New York City's old "bishop's crook" street lights and are happy that they are reappearing and replacing the minimalist "goose-necks" in some neighborhoods, but street lights, which overhang streets rather than sidewalks are mostly for cars, not real, honest pedestrians, to say nothing of residents on the street. To the rescue, of course, are lights on, as opposed to in, individual buildings. 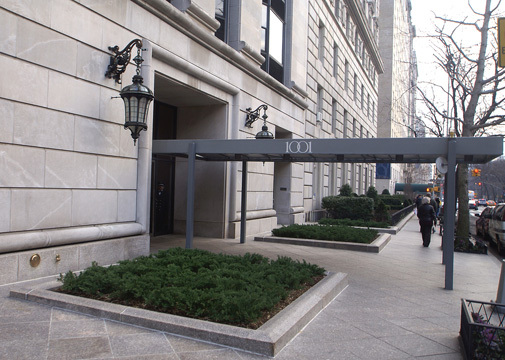 Sadly, not every building has an illuminated top to say nothing of an illuminated bottom, but some of the better apartment buildings, especially pre-wars, have lights by their entrances, usually mounted, like sconces, on the walls on either side of the entrance. These lights generally are rather unobstrusive and provide only minimal illumination, enough, say, to discern which is the front-door key, or to read front-page newspaper headlines while waiting for your date to come downstairs, or to see which side of the matchbook to strike when lighting up, or in thriller movie fashion pretending to light up, a cigarette. The city's chandelier crowd, however, deserves better and the Sherry-Netherland Hotel at 781 Fifth Avenue at 59th Street delivers. When not checking out the time at its impressive clock stanchion, just cast one's eyes back towards the building and upwards. You won't be able to see its spectacular spire, but you will be engaged, a bit frightfully, by its glorious hanging lanterns that are suspended from the large mouths of large, New York-size dragons. Staring down these dragons is probably the New York equivalent of Rocky dancing on the steps of the Philadelphia Museum of Art. Just be sure not to let your children see them, or they won't be satisfied with the available dragons at F.A.O. Schwarz toy store just down the avenue. 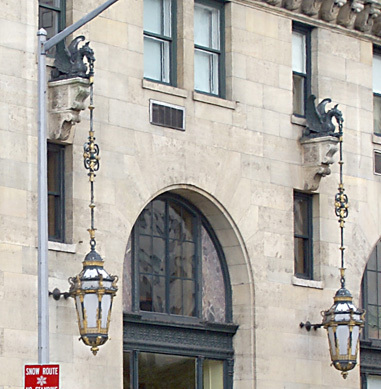 A few blocks north, 820 Fifth Avenue, one of the city's most elegant, pre-war apartment buildings, sports an attractive pair of hanging lanterns. 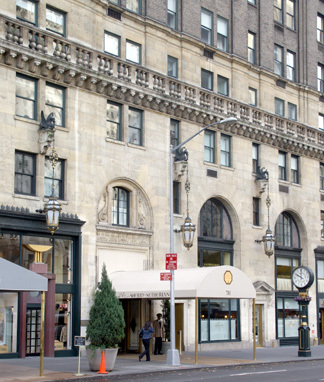 The building was designed by Starrett & Van Vleck and erected in 1916. Further north at 1001 Fifth Avenue across from the Metropolitan Museum of Art is the 1979 limestone-clad, 22-story apartment building designed by Philip Johnson that is most famous for its "false-front" roof treatment but is notable also for a quite handsome pair of hanging lanterns flanking its entrance that demonstrate that detailing was not a totally lost art in the post-war era.